Taste test: We're still trying to figure out what "All Dressed" refers to, but one of our chiptasters theorized that it's just all of the flavors that Humpty Dumpty makes mixed together onto one chip. We've tasted vinegar, salt, barbecue and bacon on these chips. The ripple texture makes it a good chip that holds its flavor, and we liked these better than the non-rippled variety. Smell test: A strong aroma of all flavors that is hard to pin down. 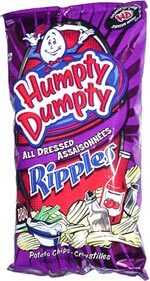 This snack was discovered by Glenna in Canada. Review published .